This is a discussion platform arguing that government size and power should be small and limited to only a few important functions, to enforcing the rule of law. Like protecting the citizens’ three important freedom: freedom to live peacefully (against aggression), freedom to private property ownership (against thieves and destroyers of property), and freedom of expression with responsibility (against dictatorship and censorship). Thus, taxes to sustain government should be low and few. Rule of law is not about "good and big" welfarist governance. Rule of law means the law applies equally to unequal people, no one is exempted and no one can grant an exemption to the restrictions and penalties set by the law. This implies that the number of laws, local and national, should be few. Where the number of laws and restrictions expand, the size and power of government, the taxes to sustain government, also expand indefinitely. Founder and President, Minimal Government Thinkers, Inc., a free market think tank in Manila. Fellow, South East Asia Network for Development (SEANET), a Kuala Lumpur-based regional center that advocates free trade, free mobility of people, and inclusive growth in the region. Wrote two books, Health Choices and Responsibilities (2011) published by Central Books Supply (Quezon City), and Liberalism, Rule of Law and Civil Society (2014), published by the Friedrich Naumann Foundation for Freedom (FNF) Philippine Office. Chapter Contributor of two books, Free Trade and Markets for Healthcare: Lessons from Asia (2013) published in New Delhi, India; and Why Liberty (2010) published in the US. Graduated from Cadiz City High School, Negros Occidental. Graduated AB Economics from the University of the Philippines, School of Economics (UPSE) in 1985, Diploma in Development Economics (DipDE) in 1998. 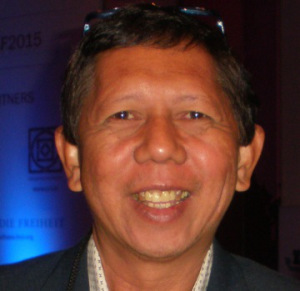 In November 2013, he was among the 13 government and civil society leaders who were granted the Freedom Flame Awards 2013 by the FNF-Philippine Office. Aside from MGT and SEANET, he is also a member of the following professional and civil society organizations: Philippine Economic Society (PES), UPSE Alumni Association (UPSEAA), Rotary Club of Taguig Fort Bonifacio (Past President, RY 2006-2007) RI District 3830, and the Economic Freedom Network (EFN) Asia. 5. Business 360, a monthly business magazine in Kathmandu, Nepal; “Free Market” column, Nov. 2012 to present.